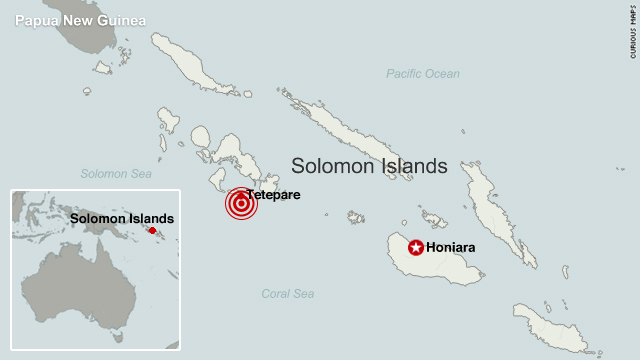 (CNN) -- A 6.9-magnitude earthquake shook the Pacific Ocean near the Solomon Islands Tuesday night, one day after a string of earthquakes rattled the same area and another quake hit the Philippines, the U.S. Geological Survey said. The quake, considered strong in terms of earthquake magnitude, hit near sparsely populated islands in the archipelago at 11:15 p.m. (7:15 a.m. ET) at a depth of 35 km (22 miles). By 12:56 a.m. local time Wednesday, there had been five aftershocks, according to the USGS Web site. "Usually when we see earthquakes of this size, we see aftershocks," said USGS geophysicist Jessica Sigala. "The aftershocks are usually smaller in size, but are earthquakes in their own right." No tsunamis were expected, according to the Pacific Tsunami Warning Center. The island located closest to the initial quake's epicenter was Tetepare, located eight miles to the north. Geophysicist Amy Vaughan said the USGS had received no reports of damage, and it was hard for the agency to predict what might have occurred until it hears from media or people living in the area. There was property damage from Monday's quakes, but she didn't know how extensive it was. On Monday, the Solomon Islands were hit by eight quakes in 14 hours, starting at 8:48 a.m. local time and causing damage to at least one village. Rattling the islands were a strong 6.5-magnitude quake at 8:48 a.m. and a more powerful 7.2-magnitude tremor less than an hour later. The Solomon Islands are situated in the so-called Ring of Fire, an arc of fault lines circling the Pacific Basin that is prone to frequent earthquakes and volcanic eruptions.